radiohead changed the face of music with their last album, 'kid a'. it wasn't actually groundbreaking because everything had been done before by people like Aphex Twin. but the main reason why kid a was so important was because of the fact that radiohead had created something that sounded like nothing out there at that time, really appealed to a lot of people, and did so using a really minimum number of guitars and more warm electronic sounds. also, something new could be discovered on every listen. the new album, 'amnesiac' was recorded at the same time as kid a was recorded. the anticipation level for this album is so high that it is expected to top the charts the first week it comes out. reviews of this album are popping up on the net like crazy and it kinda seems that the entire music world is centered around this one amazing band. so now, let's get to the cd. 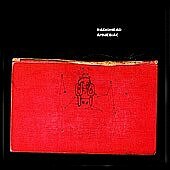 differences from kid a: amnesiac is more rhythm oriented on the fast, semi-techno songs. songs like the opener 'packt like sardines in a crushd tin box' are very beat-y. in fact, 'packt' actually sounds like 'idoteque' from kid a, complete with disorienting drumbeats and uneasy vocals. and speaking of vocals, quite possibly one of the world's best vocalists, thom yorke, turns in a splendid performance here. more info on his marvelous accomplishments will be popping up soon in this review. 'packt' also has one of the best yorke-ism's i've heard: 'after years of waiting, nothing came. i'm a reasonable man, get off my case.' i'll bet you my cd player that that line's gonna get stuck in your head for a long time. moving on to one of the best songs on the album and also the first UK single, 'pyramid song'. this could be, as yorke himself admitted, radiohead's finest recorded moment to date. starting off with a warm piano line and 'i jumped in the river and what did i see, black-eyed angels swam with me', it builds and builds into one of the most mesmerizing and transcendental pieces of music ever made. after the first verse, yorke's voice just drifts off into a howl, and egyptian-flavored violins provide the backing music. then comes a strings vs. drums battle with killer time signatures. and then the grand finale: after the last verse, the strings swell up into a dizzying crescendo and comes crashing back down on to the ears of unsuspecting listeners. needless to say, i was so completely floored after listening to this song that i had to turn off the cd player, go into the kitchen and get myself a drink of water. so stunningly awesome. next comes the experimental beat-fest 'pulk/pull revolving doors'. it has very distorted vocals, like the Dread voice on ok computer, but its actually yorke messing up his own vocals using protools. the beats are fairly simple and a word of caution, don't turn up your headphones and listen to this song, because my cheap eight dollar headphones actually fell to pieces. and then there is 'you and whose army', one of my favorites on this album. supposedly an attack on tony blair, the british prime minister, it gets the point across with lines like, 'come on, come on, you think you drive me crazy, come on, come on, you and whose army, you and your cronies'. yorke's vocals are delivered through a eggbox (literally...) and are only backed up a piano and an upright bass, but then the full band kicks in and the song evolves into a reaching-for-the-skies rocker, with an incredibly fine vocal performance by yorke. 'i might be wrong', one of the best rockers on the cd, has electronic drums and is centered on a bluesy guitar riff by head noiseman Jonny Greenwood. it might not seem like a big deal on the first listen, but it soon grows on you. it's only after a couple of listens that i actually got how good that song actually is. a pretty good choice for the first US single. i really think its gonna appeal to the 'limp bizkit rocks, dude' guys out there. then there's 'knives out', which is slated to be the second US single. One of the more surprising songs on the cd because its actually a no-frills rocker. even more surprising is the fact that it has a lot of smiths-esque chiming guitars. it also has some disturbing lyrics, which are allegedly about cannibalism. even more disturbing are the lines, 'look into my eyes, i'm not coming back'. sure, it may have double meanings, but the one i'm more concerned about is the most striking one: radiohead breaking up. there were already rumors that the band were on the verge of breaking up after finishing this cd, mainly due to trivial matters like the tracklisting and the artwork. phew... i don't even want to think about it. anyways, right after 'knives out' comes 'the morning bell / amnesiac'. this song was originally featured on kid a, but the one on this album is a different version of the song. its equally disturbing as the other version, but features more likeable sounds like bells and an atmospheric background. and then there's the bass-driven monster called 'dollars and cents.' this was a crowd favorite long before it was on this cd, and very deservedly because this is one awesome song. every single instrument, including the vocals are drenched in reverb and it also features a string section which hugely complements the song. this song has so much negative energy, so much bile and so much raw guts that it is kinda scary. its high up there with 'climbing up the walls' from ok computer as one of the band's most creepy songs. in the middle of the song, there is a multilayered vocal which is just pure energy. and then some of the few more remarkable lines on this album, 'we're the dollars and cents, and the pounds and pence, and the mark and the yen, and yeah we're gonna crack your little souls,' with the "crack" pronounced as if yorke means every word he's saying. there's a short insturmental called 'hunting bears' that's actually one guitar tone stretched out over two minutes. right after it comes the headphone-fest called 'like spinning plates'. it's the most experimental song on the cd and is downright awesome. first a little bit of 'the making of spinning plates'. apparently, thom yorke, the crazed genius that he is, actually sung the song backwards while recording. and then his vocals were reversed when they were mixing the song so that they sound disjointed, but normal. don't get it? read the last two lines again. the chorus is incredibly catchy and won't leave your head for weeks. and what's even more amazing is that the song actually sounds like spinning plates. you can actually hear the whirring, whizzing sound that objects make when they spin. their best experimental track. radiohead always have this magnificent tradition, the last song on each of their albums is a strong contender for the best song on the album. and amnesiac's last song doesn't disappoint. 'life in a glass house'. written by thom yorke and played during the ok computer-era during soundchecks. i cannot believe how good this song is. on kid a, radiohead delved into, for the first time, jazz instrumentation. so radiohead move that aspect of their music one step forward, and they recruit jazz great Humphrey Lyttleton to play on this track. this song doesn't have experimentation, this song is not a rocker. it is a JAZZ song. it sounds like some freaky new orleans funeral march / big band bootyshaker. you can't actually plug this song into a particular category. it just exists. a complete brass brand's all over the song, with trumpets wriggling on top of yorke's voice, and a clarinet on the left and a sax on the right. and then when the chorus comes in, the whole thing just explodes, the trumpet is really, really high-pitched and the first time i heard it, it made the hairs on the back of my neck stand up. this is also the most paranoid song radiohead have ever done. just listen to this...'of course i'd like to sit and chat, of course i'd like to sit and chew the fat..., but someone's listening. 'with the emphasis on the someone's listening part. just think of one band that has ever been so paranoid that they're scared of their fans listening to their music, and actually said it out loud in a mainstream album. name just one...can't? that's how messed-uppedly brilliant radiohead are. this is the biggest review that i've ever written. this album deserves this big a review. i really don't mind spending an hour and a half of my life promoting this band because they could be, right now, the best band in the entire world. plans have already started for LP 6, and i'm just drooling at the mouth for that. ever notice that people always compare other bands to radiohead? of course you did. you know why? because everyone who's ever listened to any of their songs can't get enough of them. they need more radiohead. 'please, God, give me more radiohead. i'll build several churches in your honor if you give me more radiohead.' i've done it before. it's fun. okay, let's cut the small-talk. if you don't want to get it yourself, fine, it's your loss.